Without legal protection cruelty against animals will go unabated. The complaints on Dr Umesh Dahal’s desk at the office of Directorate of Animal Health (DAH), Tripureshwor keep piling up. The most common issue of late has been about the transportation of bulls. Various witnesses and activists have expressed outrage at the appalling conditions in which the livestock are bought to the capital from the outskirts of Thankot. Apparently, there are evidence of beatings and other mistreatments. Dr Dahal claims they even found that many trucks had tied the animals’ tails to the roof poles so as to keep them steady during the course of the road trip. It’s a snapshot of the apathy towards animal welfare that Dahal comes across almost every day. At the central level, DAH is responsible for managing overall animal health related activities throughout the country. Along with working on diagnosis, prevention and control of animal diseases, they also implement programs for increasing production of milk, eggs and meat in the country. But inevitably issues of legislation, law and policies for animal welfare have made their presence felt. 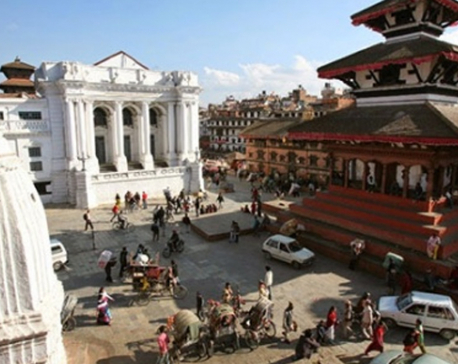 They have realized that Nepal can no longer be one of the few countries in the world without animal welfare legislation. “It’s been a while that we have realized that we can’t do our job without protecting the basic rights of the animals first. It is shocking to hear cases of such mistreatment but at the moment, the most we can do is punish the culprits. We are working on suing the handlers who were transporting the bulls. Policies, on the other hand, would help prevent these unfortunate events. There would be guidelines for care takers to abide by,” says Dahal. This realization on the government’s part is what has been fueling Animal Welfare Network Nepal (AWNN) determination to start a movement for the last five years. It was AWNN that presented the draft of Animal Welfare Act based on the internationally recognized five freedoms of the animals to the concerned government authorities and they are still collaborating with them on finalizing the bill. So in 2011, AWNN helped introduce an Animal Welfare and Ethics Committee as well as penalties for abusers. They based it on the internationally recognized five freedoms of animals i.e. freedom from hunger and thirst by ready access to fresh water and diet to maintain health, freedom from discomfort by providing an appropriate environment including shelter and a comfortable resting, freedom from pain, injury, fear, distress and freedom to express normal behavior and lastly, freedom to medical attention in times of need. Basically, the idea is that animals must be allowed to live with dignity as well. It’s a notion that R.B Neuapne too has been trying to reinforce with his work. He may not have affiliations to well established organizations like AWNN, but with his own small initiative called Math Mandir, he has been rescuing stranded cattle and cows around the capital. Currently, there are more than 100 livestock under his care and he has seen firsthand the degree of mistreatment that various animals have been suffering in absence of firm policies to protect them. “Just last night, we got a call asking us to help rescue an injured cow that had been abandoned by a riverside. The neighbors had seen it lying around for a couple of days. Since it was injured, it couldn’t feed itself either. I suspect that it was deserted by its owner. We see these cases almost every week. Once the livestock becomes old, injured or they cease to stop a purpose, the owners tend to take them far away from their homes and leave them there. Every now and then, we find some cows with blindfolds around them as well. I guess, the owners wanted to be extra sure that they wouldn’t find their way back,” shares Neupane. He says he simply doesn’t understand people’s lack of conscience on the matter. However, abuse of domesticated animals seem rather minor in comparison to the fate that some Nepali traditions bring upon some animals. The way Ashok Maharjan, a resident of Khokona, sees it animal welfare in our country isn’t a matter of conscience alone. From what he sees around him, the issue finds itself tightly wrapped up around culture and politics as well. After living in Khokona for three decades and annually witnessing the infamous festival where a live goat is ripped by a villager’s hand, he along with a group of other members of the community decided to fight back against the brutal practice last year. They carried our researches, joined forced with animal activists and talked to local authorities as well as their community. Still they weren’t able to stop the festival. “These changes won’t happen overnight. There are superstitions, religious beliefs and pride involved in the matter. Further it seems, there are political agendas at play too because last year when we talked to the local ward office and other authority figures, it seemed like they would cooperate with us. But then, later they changed their minds. They didn’t give us any explanations either,” says Maharjan. Despite the obstacles, they plan to spread awareness and start dialogues to deter people from participating in the Khokona festival this year too. Animal welfare organizations like AWNN are well familiar with this kind of defeat. After all, the spark that started their movement was the Gadhimai festival. The highly publicized sacrificial ceremony is the center of their agendas. Sapkota talks about how it epitomizes the animal welfare crisis in our country and the intricacies involved in the issue. 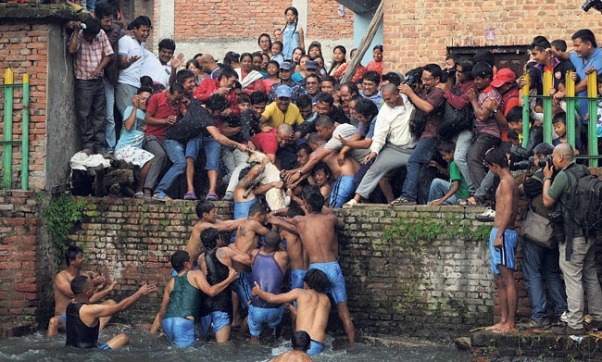 “When Gadhimai takes place, there is literally a sea of people. There is traffic everywhere and even those walking take hours to reach the spot so you can imagine, it’s a challenge to stop them from carrying out the sacrifices. This will take years of dialogue and awareness campaigns. We must start by giving them alternatives as well. There could be an option to offering sacrifices,” says Sapkota. It’s a tricky scenario that AWNN are trying to overcome. It’s also the reason why animal rights is a farfetched proposition in our country. The idea that all non-human animals are entitled to the possession of their own lives and that their most basic interests should be afforded the same consideration as similar interests of human beings isn’t a view that will be whole heartedly accepted in our society, not right now anyways. But we can begin with the animal welfare issues. We can ensure the five freedoms of animals to start with and after that take it one step at a time.